US PRESIDENT DONALD Trump said he hopes to organise a second summit with North Korean leader Kim Jong Un in early 2019, perhaps as soon as January or February. Trump told reporters travelling home aboard Air Force One from Argentina that “three sites” were in consideration for the meeting, a follow-up to their historic summit in Singapore in June. Trump had been in Buenos Aires for the G20 summit. 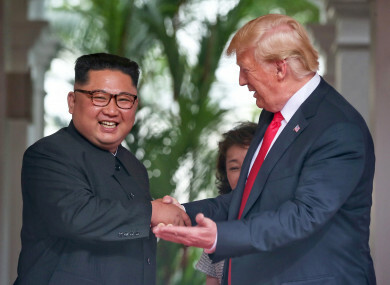 In June, Trump and Kim opened up dialogue on denuclearisation of the Korean peninsula after months of trading military threats and pointed barbs. But differences have emerged between Washington and Seoul on how to proceed with Kim, as the dovish Moon has long favored engagement with the North. The United States also confirmed that it had agreed to suspend new tariffs with China for 90 days as the two powers seek to end a trade war. The White House said a threatened increase of tariffs on $200 billion worth of Chinese goods from 10 to 25%, which was set to take effect on 1 January, would be put off for 90 days. “If at the end of this period of time, the parties are unable to reach an agreement, the 10% tariffs will be raised to 25%,” a White House statement said after dinner talks between Trump and his counterpart Xi Jinping at the G20 summit. China earlier confirmed the details of the arrangement, saying that officials of the world’s two largest economies would get to work on resolving a range of trade disputes. The White House said that China has also agreed to step up purchases “immediately” of an unspecified amount of US agricultural goods. Amid the trade tensions, China has sharply curtailed its purchases of US soybeans and other produce, dealing a significant blow to farmers, a major support base for Trump. Email “Donald Trump plans meeting with North Korean leader Kim Jong Un in 2019”. Feedback on “Donald Trump plans meeting with North Korean leader Kim Jong Un in 2019”.